M. Lagi, Yavni Bar-Yam, K.Z. 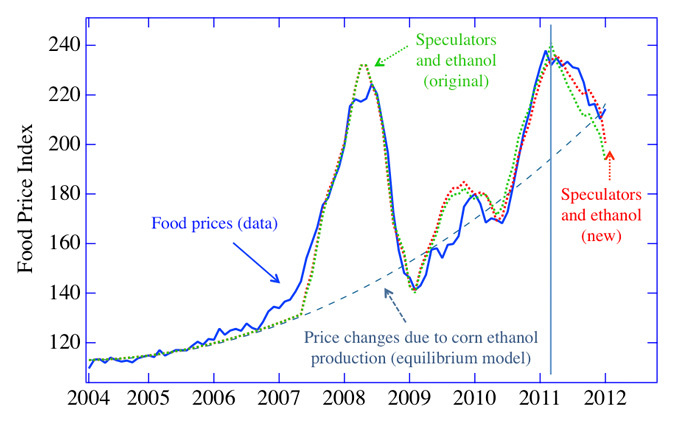 Bertrand, Yaneer Bar-Yam, UPDATE February 2012 — The Food Crises: Predictive validation of a quantitative model of food prices including speculators and ethanol conversion. arXiv:1203.1313, March 6, 2012. Increases in global food prices have led to widespread hunger and social unrest—and an imperative to understand their causes. In a previous paper published in September 2011, we constructed for the first time a dynamic model that quantitatively agreed with food prices. Specifically, the model fit the FAO Food Price Index time series from January 2004 to March 2011, inclusive. The results showed that the dominant causes of price increases during this period were investor speculation and ethanol conversion. The model included investor trend following as well as shifting between commodities, equities and bonds to take advantage of increased expected returns. Here, we extend the food prices model to January 2012, without modifying the model but simply continuing its dynamics. The agreement is still precise, validating both the descriptive and predictive abilities of the analysis. Policy actions are needed to avoid a third speculative bubble that would cause prices to rise above recent peaks by the end of 2012. CAMBRIDGE (March 6)--According to a new study from the New England Complex Systems Institute the next food price bubble will occur by 2013. "The food price bubble of 2011 caused widespread hunger and helped trigger the Arab spring. In 2013 we expect prices to be even higher and may lead to major social disruptions." said Professor Bar-Yam President of NECSI, who has just returned from Davos where he presented his findings on speculation in global commodity markets. His paper "The Food Crises: A Quantitative Model of Food Prices Including Speculators and Ethanol Conversion" was called by Wired magazine one of the top 10 discoveries in science of 2011. In 2008 and 2011 increases in global food prices triggered hunger, food riots and social unrest in North Africa, the Middle East, and elsewhere, at a cost to global stability which policy makers can no longer ignore. Over the past decade, world unrest has sharply increased at time of peak food prices; now the long-term price trend is getting close to what used to be episodic peaks. According to the new study, the next food price peak will take place in about a year. The results will be dramatically higher prices than we have encountered thus far. The study warns that should ethanol production continue to grow according to multiyear trends, even the underlying trend will reach social-crisis levels in just one year. NECSI’s latest findings reveal that the model from their 2011 paper still fits food price price trends. Their update reveals one important shift, however, in price trends, which might add to, not lessen, global instability. "The current trend of prices suggests that in the immediate future market prices may become lower than equilibrium," says the study, "consistent with bubble and crash market oscillations." Lower prices at first may seem like good news as a reprieve from the extremely high food prices seen in the past, but the study says that the drops are likely to be short-term. To examine what is driving the rises in food prices, researchers at the New England Complex Systems Institute (NECSI) performed a detailed study in 2011. The Institute, which uses mathematical modeling to reveal social and political trends, drew from the FAO Food Price Index from January 2004 to March 2011, and investor movements—shifting among commodities, equities and bonds. The analysis discovered two key drivers behind the rise: investor speculations and the rush toward conversion of corn to ethanol. The study was presented by invitation at the World Economic Forum in Davos and featured as one of the top 10 discoveries in science in 2011 by Wired magazine. This month, NECSI is publishing the results of its study update, in which the institute extends its food price model to January 2012, entering no modifications to the model and continuing to use its dynamics. NECSI’s researchers said the model they have used to examine food prices has proven to be robust and consistent with ongoing behavior of food prices. Bar-Yam, who co-authored last year’s food-price study as well as the latest study update, said that the fit with the FAO Food Price Index is still "strikingly quantitatively accurate, validating both the descriptive and predictive abilities of the model. "To extend NECSI’s earlier model ten months out and to still witness a fit is important," he added. "This means we have validated it for data that was not around when we first made the model. It predicted the burst of the 2011 food bubble at the exact time it happened, when many were saying that high food prices were there to stay. Success in predictive validation is remarkable. The conclusions are reinforced greatly that high food prices are due to ethanol and speculators--with all the relevant policy implications." "The current equilibrium value is about 50% higher than the prices prior to the impact of the ethanol shock. And the projected time until the next food price bubble is about a year." The results will be dramatically higher prices than encountered thus far. FIG. 1: Food prices and model simulations - The FAO Food Price Index (blue solid line) , the ethanol supply and demand model (blue dashed line), where dominant supply shocks are due to the conversion of corn to ethanol so that price changes are proportional to ethanol production (see , Appendix C) and the results of the speculator and ethanol model (green and red dotted lines), that adds speculator trend following and switching among investment markets, including commodities, equities and bonds (see , Appendices D and E). The green curve is the fit extended to the present with the original parameter values, the red curve is the fit with new optimized parameters. The vertical blue bar marks the end of the original fit in March 2011. M. Lagi, Y. Bar-Yam, K. Z. Bertrand, Y. Bar-Yam, The Food Crises: A quantitative model of food prices including speculators and ethanol conversion, arXiv:1109.4859v1 [q-fin.GN] (2011 http://arxiv.org/abs/1109.4859). Food and Agriculture Organization of the United Nations, FAO Food Price Index (http: //www.fao.org/). Are Wall Street Speculators Inflating the Cost of Food? Back to the Future: Will Food Riots Become Our Norm? Model predicts global food price hike! Oil and Food Speculators Drive Prices Up!